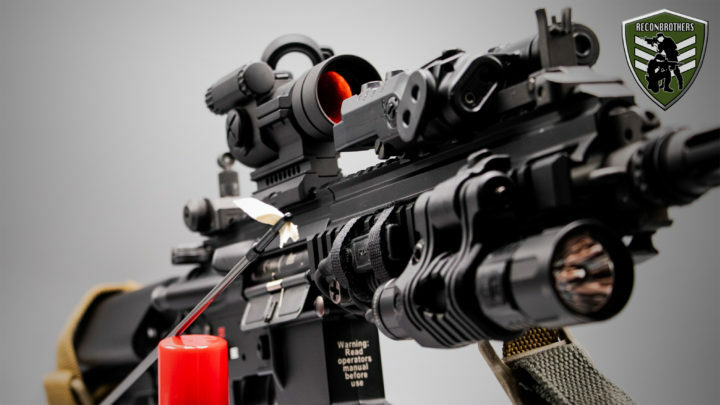 In today’s blog we’re going to show off a bit with our assault Airsoft gun setups. Before we go a little bit further into our specific gun setups, we want to mention our mindset when it comes to Airsoft guns in general. The thing is, that we both rather have 1 or 2 very reliable high quality guns instead of having dozens of lower quality ones with tons of upgrades. And yes, we know a lot of guys out there with an armory as big as an American gun freak. In fact, the truth is that lower quality Airsoft guns with upgrades actually never can shoot as far and as accurate as high quality ones out of the box can. This all has to do with the way the hop-up system is build. But that info might be something for a future blog. What’s the base of our setup? My brother and I are always in search of the most realistic possible experience. This also translates itself in our weapon builds and usage. We personally experience this sport as a way to practice tactics and weapon handling in more of a training way and immersive experience rather than just shooting at people. And yes, that also means running around with 30 round magazines. Currently we run around with AEGs. Why? Well, because they are the most reliable ones in all sorts of weather conditions. 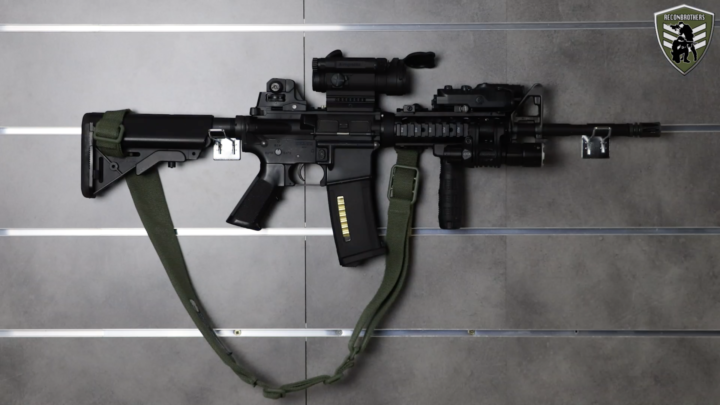 We could have also chosen for a GBBR which functions much more realistically, but it requires more maintenance and is generally considered to function poorly in cold weather conditions. Which has to do with the fact that gas cannot expand as good in cold environments as in warm ones. Although we would both like to add one to our collection someday for those summer events. The question why we never picked up one with a HPA system has to do with the realism factor as well. Because of those tanks, tubes and all that stuff that just gets in the way. For starters. I run around with a M4A1 SOPMOD and my brother uses a HK416 DEVGRU. These are both models from the Next-Gen series manufactured by Tokyo Marui. Most of you out there will already know this. 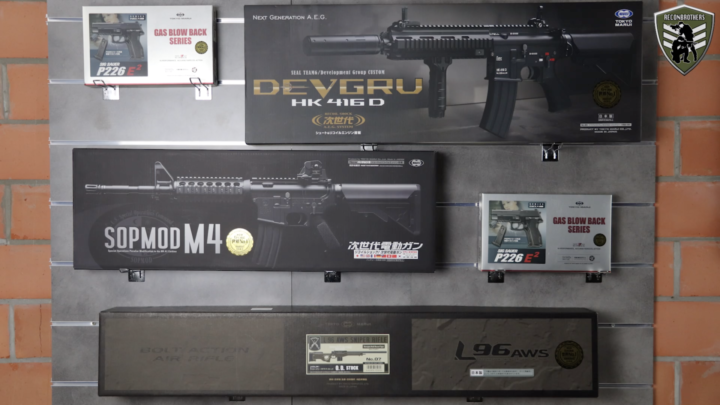 But for the rookies out there, Tokyo Marui is one of the best manufacturers in the world regarding Airsoft weapons. They are the ones who started this very sport and are till today one of the small group of leaders when it comes to R&D regarding these things. 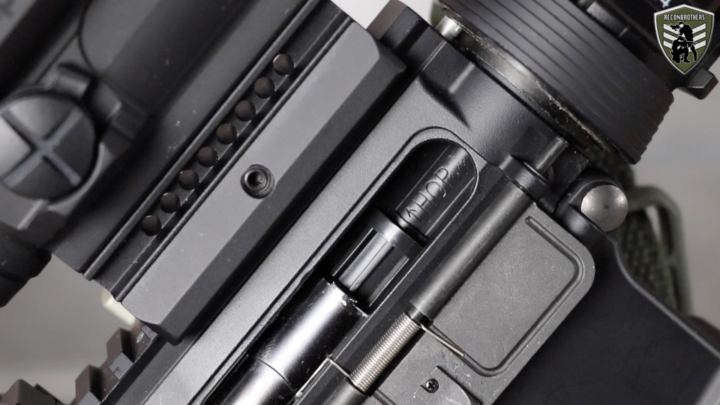 And that’s visible in the unique hop-up system and Tokyo Marui’s Next-gen AEG and GBBR series. So, why the Next-Gen series? Well, this comes down to the realism factor they provide. The Tokyo Marui next-gen Airsoft guns are provided with recoil, and a bolt catch to function as closely to the real thing as possible. And on top of that, getting a great range and accuracy without braking the bank. 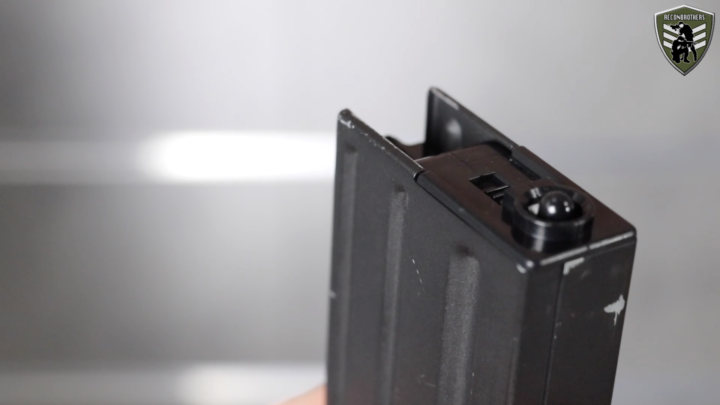 Now, in order to get that bolt catch function we use special magazines designed for these Airsoft guns. We have been running around with the ones manufactured from Tokyo Marui themselves, but had a few ones fallen on the ground in the past, which made some parts bend and makes them not useable anymore. So recently, we got a few mags delivered from PTS syndicate which are made of a very strong polymer and hopefully these can handle the beating more than the other ones. Before we go over the stuff we’ve mounted on these bad boys. We’ll go over what modifications these two underwent on the inside. Just to make it clear to you guys, these Airsoft guns shoot great out of the box. 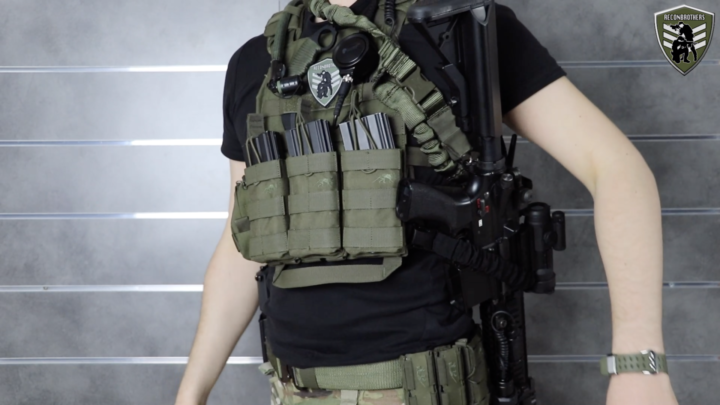 We’ve used our Tokyo Marui replicas for over a year as being fully stock and they already outranged most opponents. For this we used 0.25 gram BBs to deal with the outdoor external forces. But this implied that these BBs were not flying very fast. Only thing is, these things shoot about 280 or 290 feet per second with 0.20 gram BBs. While in our country and I believe most of the EU countries, it’s allowed to reach up to 360 fps with fully automatic Airsoft guns. To crank up the fps output we’ve decided to put an Eagle6 spring in them. 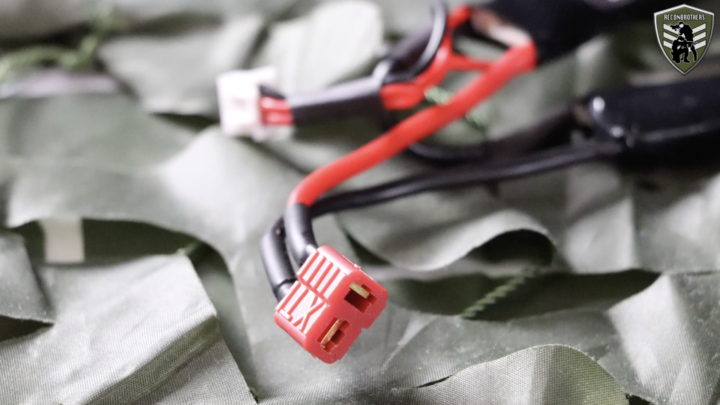 Furthermore to get a better trigger response we’ve decided to get a Lipo battery modification with Deans connectors. 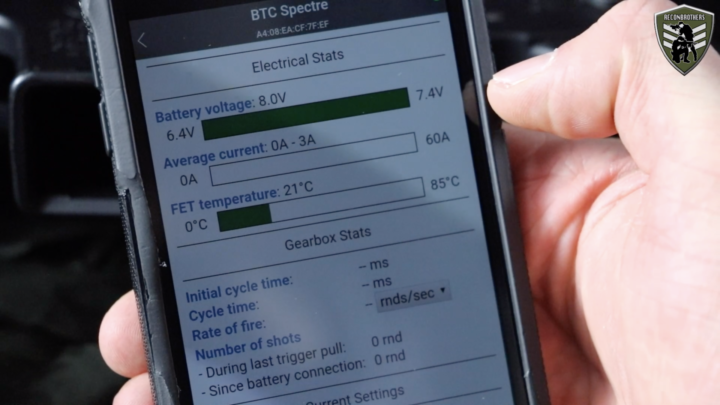 And since they needed to be opened up, we’ve also got a BTC Spectre MOSFET inside them. 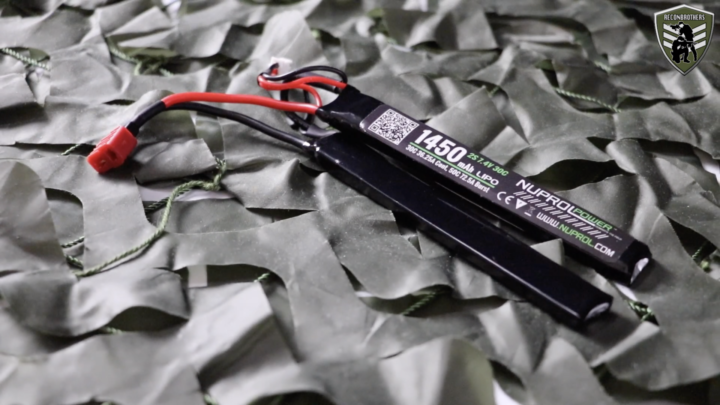 Such a MOSFET not only allows for a more customizable setup, but also monitors and protects the motor and the batteries from dying and avoids any failure in the system. Thanks to these upgrades we can shoot heavier 0.28 gram BBs which maintain their energy better and are less affected by wind. And all this at a higher muzzle velocity than we used before. Like we already mentioned in one of our previous videos. 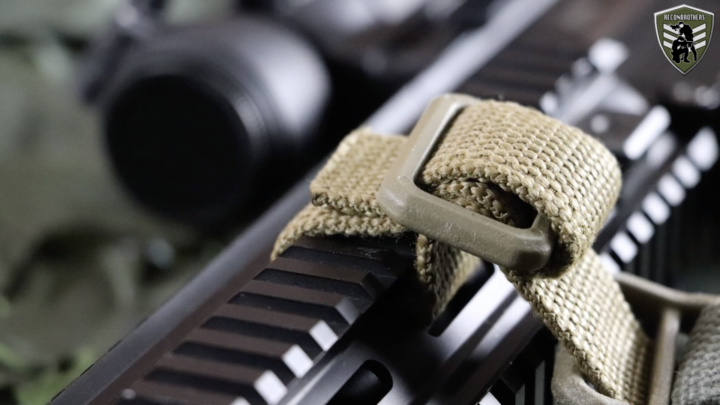 In order for your gun to fully serve you, you need to have some sort of a sling system that adds to how you function together with your gun. 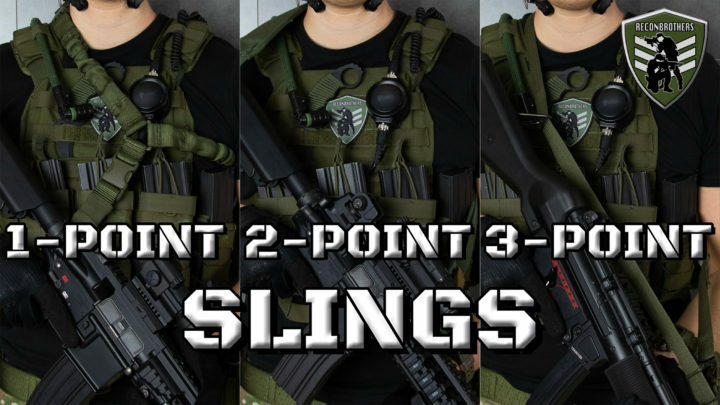 So for us, a 2-point sling came out on top after testing a lot of different ones. 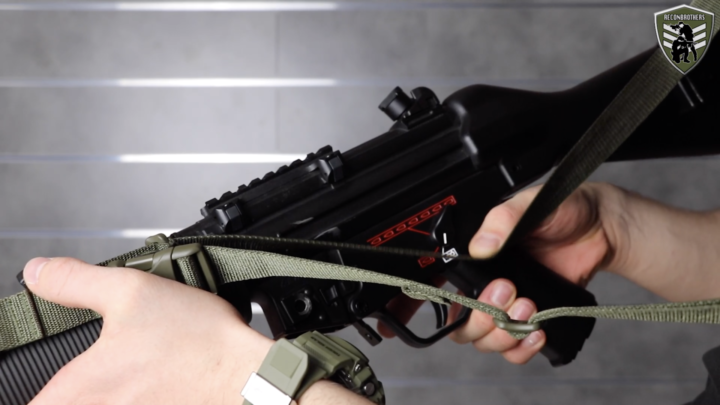 Why not a 1-point sling? 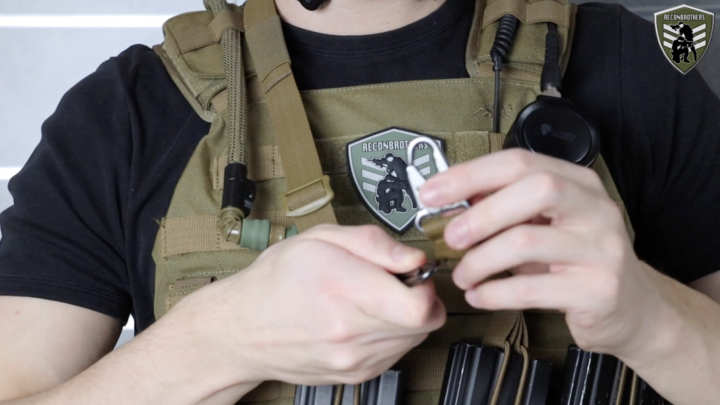 Why not a 1-point sling? 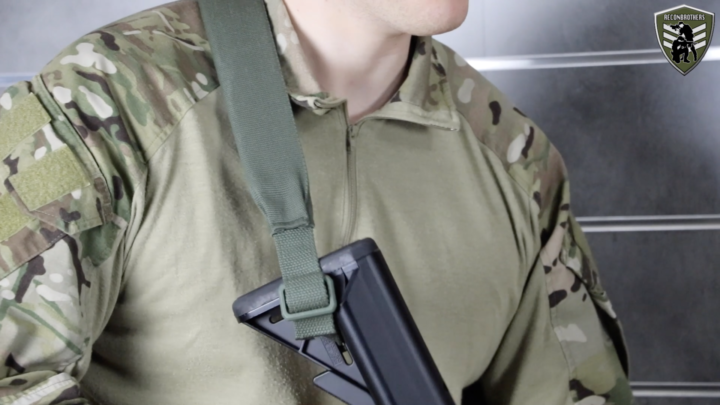 Well, we’ve had a hybrid sling in the very beginning of our own Airsoft adventures which enabled us to test between a one and a 2-point sling. And the thing is that in some very steep situations when we needed both of our hands to climb up or down we could only rely on a 2-point sling being secure enough. 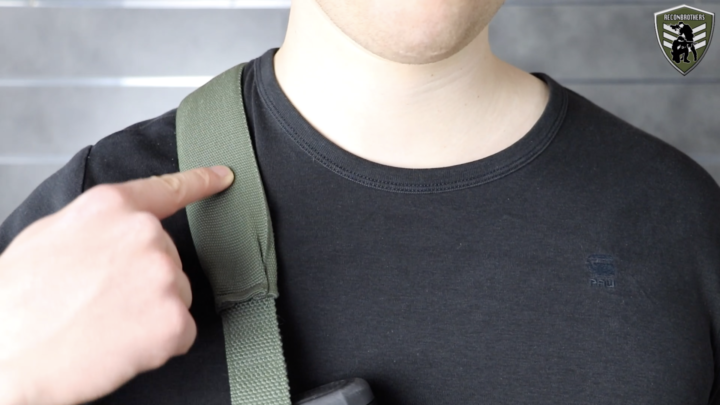 And for us personally, a 1-point sling jiggles too much around in too many situations. 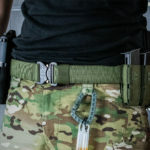 Now, recently we discovered something called a storage sling to secure your gun with even a one-point sling more closely to your body. Although this is not the easiest thing to do, it might actually be a good solution if you still prefer to use a 1-point sling and want to climb a ladder for example. Why not a 3-point sling? 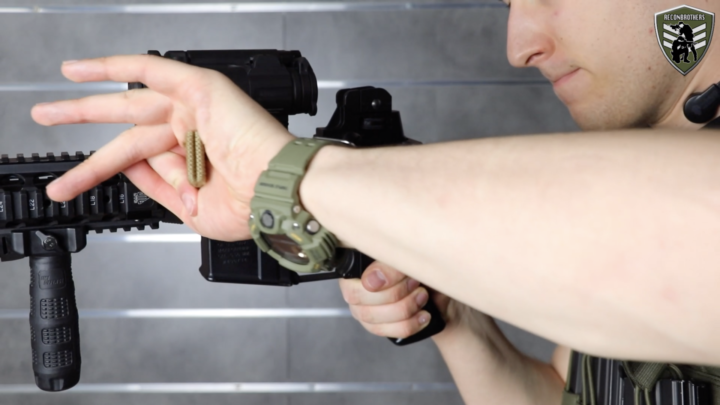 So, why not a 3-point sling? Well, that has to do with it having a lot of material which gets too much in the way and can cause us to fight with our equipment. 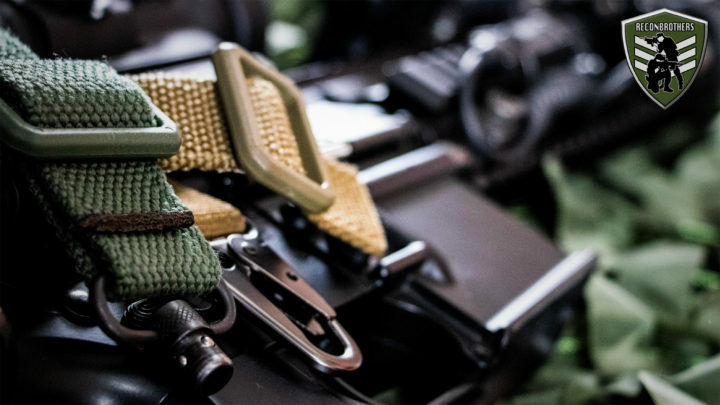 Why not MOLLE clip systems? 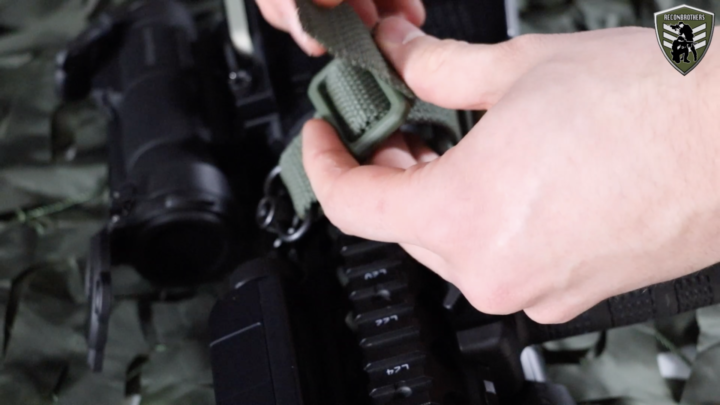 We’ve also seen a few products on the market being some sort of tactical MOLLE clip systems to carry your gun on your carrier or vest. 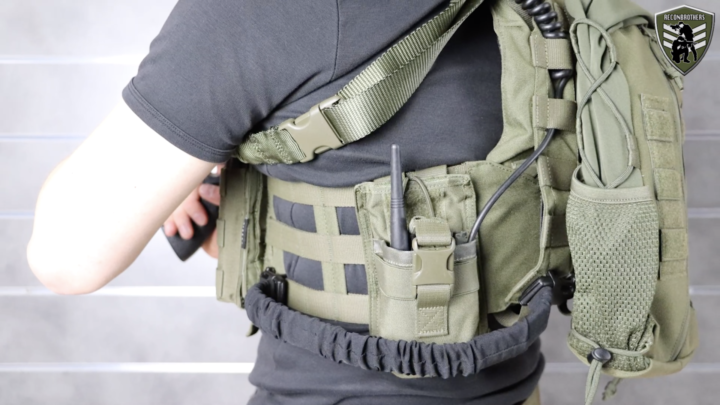 But, if we go back to what a sling is designed for we see some things missing with these clip systems. Namely, the transition to a sidearm cannot be done fluently and fast anymore. Secondly, it cannot function as a support tool to steady your aim and absorb recoil if your gun has any. 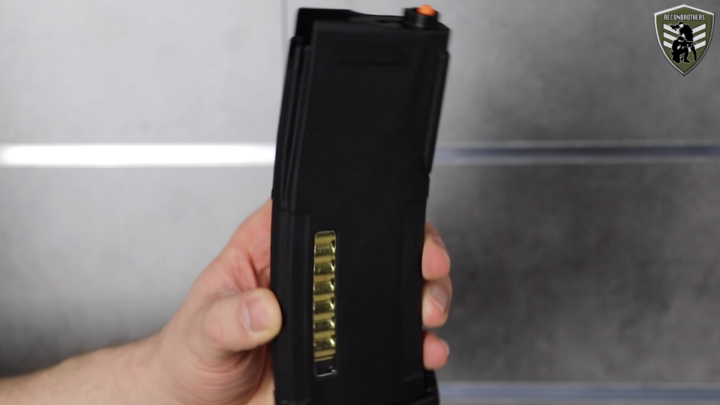 Also reducing the weight of your gun to avoid arm fatigue is not the case anymore. 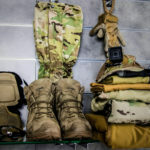 And, while it is a carrying tool, the weight is not carried on your shoulders anymore, but is carried on your carrier or vest on a single spot. 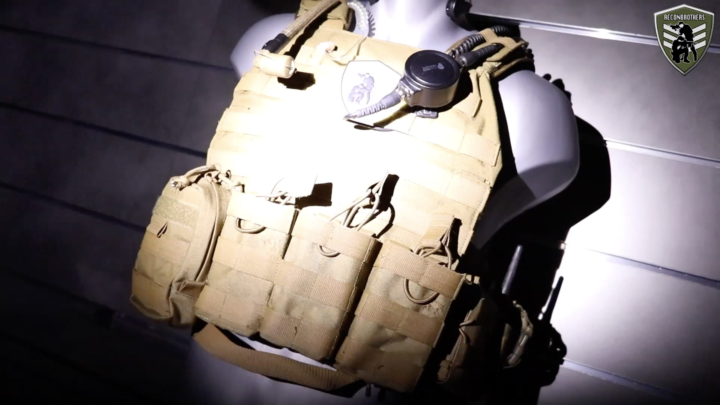 And that doesn’t only requires MOLLE space, but also pulls everything down. So, that makes us not really a fan of these kind of systems. What sling do we use? 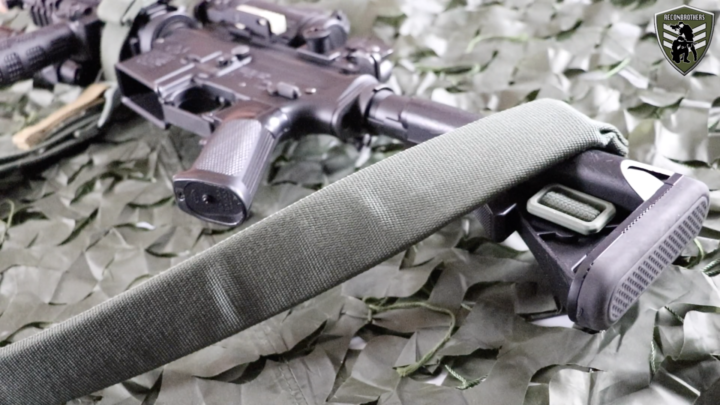 Now, the 2-point sling that we currently use is the Blueforce Vickers sling. And yes, it’s an expensive sling but it’s a very, very good one. It features a padding to disperse the force of our 4 kilogram weighing guns. And has a quick adjustability which has become about a standard for us. Especially for switching shoulders and securing your gun tightly to your body, this feature is awesome. 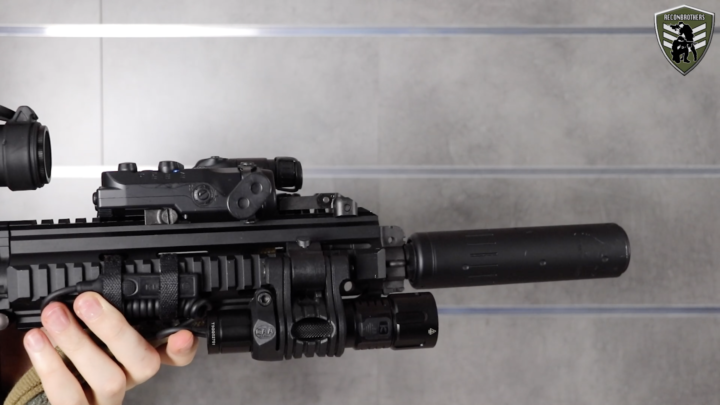 Now, how we have set these up at the moment is by mounting a point on the handguard as closely to the receiver as possible. Although this makes the gun less stable to carry them on our backs, it does allow for a good barrel freedom. Viper mounted with a QD swivel and Instinct just looped it through his handguard. 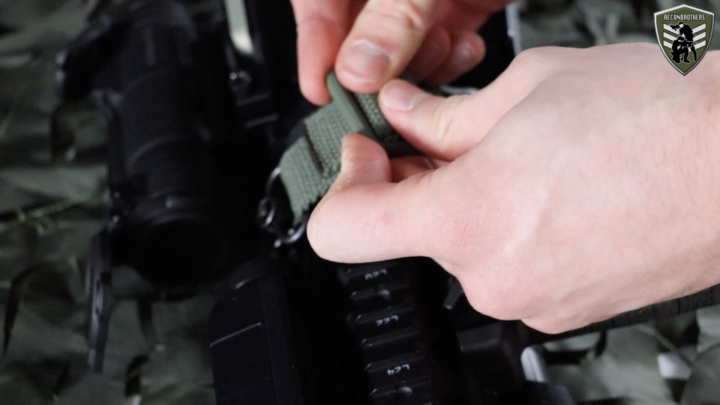 A neat trick for added strength we apply on our sling is to double lock the material through a triglide. This by going through it and back with the sling material. This is an added security and will definitely not loosen up your sling. 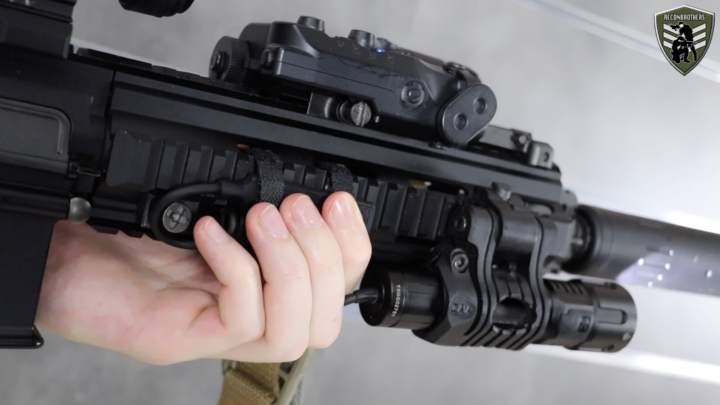 The second point is mounted on our buttstock of our Tokyo Marui replicas on the outward side, away from our bodies with a loop through a triglide. 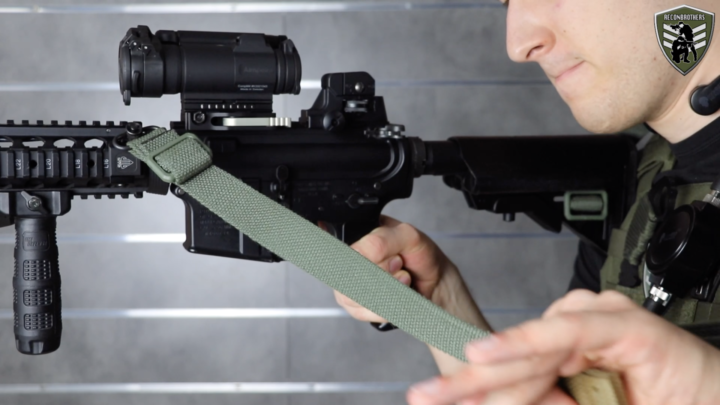 For us, this is a slightly better way to control the sling rather than it being mounted on the inside of the buttstock towards your body. This also avoids making a choke point for when we directly switch shoulders. Let’s go over to the optics. 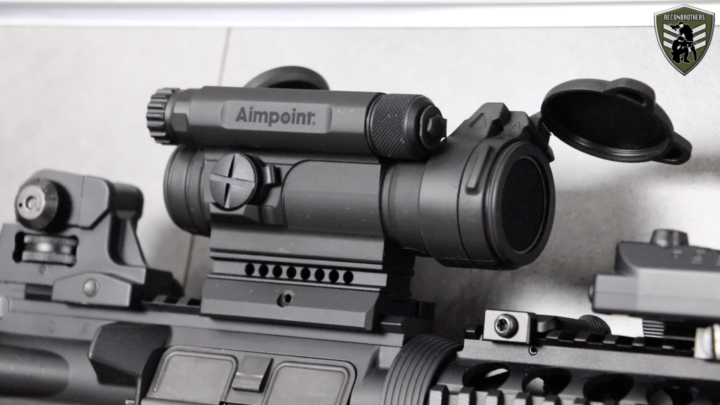 Instinct uses an Aimpoint Pro and Viper uses an Aimpoint Comp M4 since the production of the Pro version has been stopped. 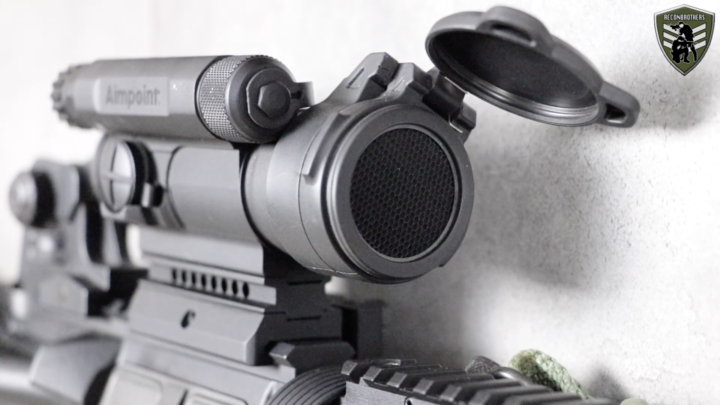 We know some of you will be screaming in front of their screen right now yelling: An Aimpoint for doing Airsoft! Are you insane! But, we obviously have our reasons for this. 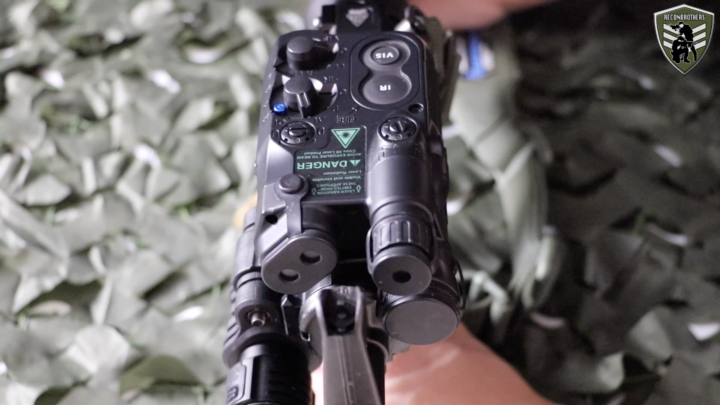 First thing you need to know is that we’ve used Airsoft reproduction optics in the past going from red dots to holographic lookalikes and ACOGs. And our experience tells us that you better stay away from that stuff. These things function poorly in certain conditions and are not very reliable. So, if you’re looking for optics, the best thing you can do is go for the real steel ones. Now, this doesn’t necessarily mean that you have to start looking for your old saving piggy again to get those very high end ones. Because there are a lot of very good budget ones out there as well. You will pay more than for a cheap Chinese reproduction, but they will last and serve you very well. 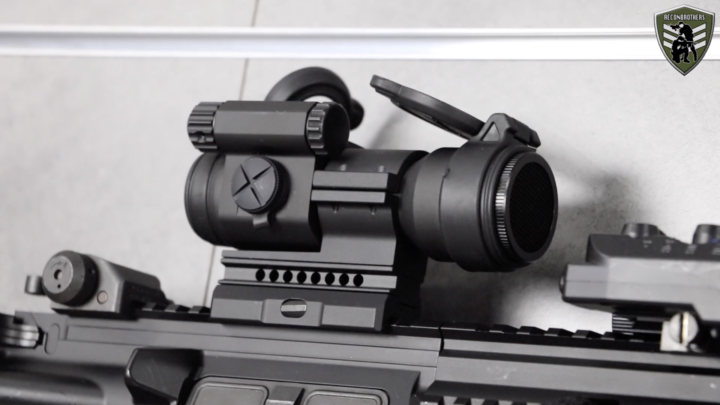 But still, why choose for such an expensive Aimpoint optic then? Well, this is because one, it will do a lifetime and two, we need these to execute some of our plans for the future. But, we can’t reveal too much about that stuff at the moment. 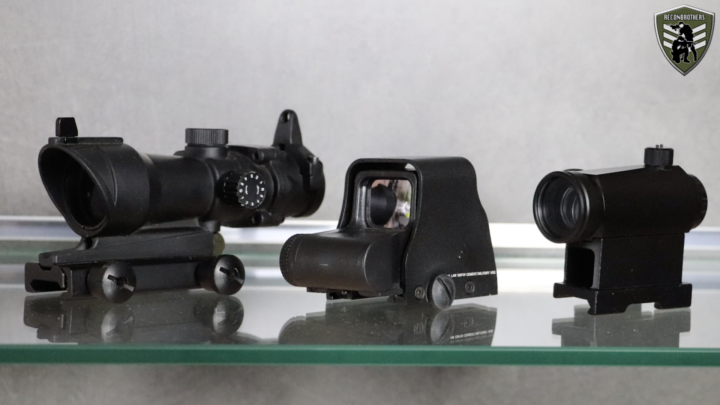 So, furthermore when it comes to our optics we both use a kill flash, ARD, honeycomb or however you want to call it to protect our lenses against incoming BB projectiles. 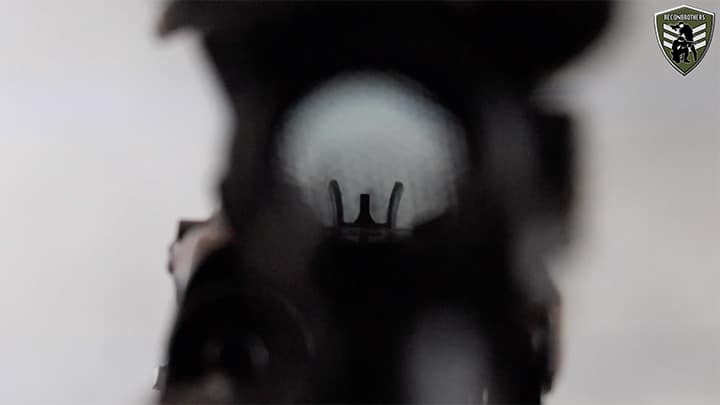 Above that we also keep our iron sights on our weapon systems as a back up when needed. Which would be very unlikely, because Aimpoints have a runtime of a few years on a single battery. But you’ll never know when a battery dies. Now, how do we position our optics? 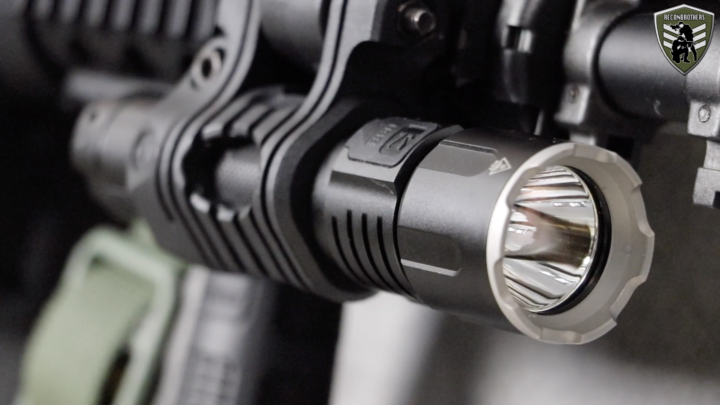 Well, we position them as much as possible towards the front of our receiver on top of the ejection port to avoid having a tunnel vision and maintain a good surrounding awareness. Also, the way we zero in our sights is something we came up with ourselves. 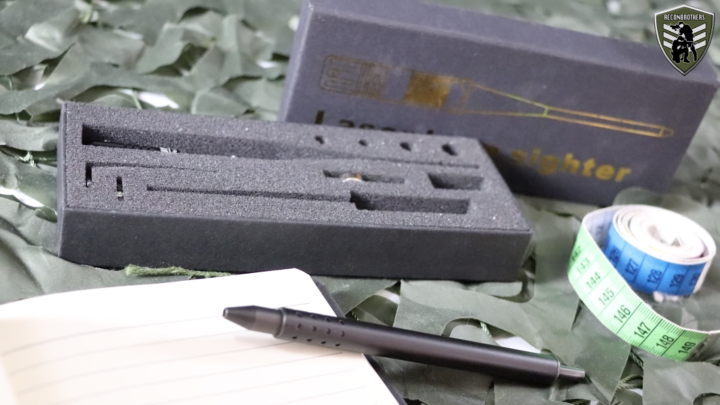 With the help of some very simple measuring, a bit of math and a laser bore sighter we set our scopes to an exact distance of 30 meters in a room much, much smaller than that without firing a single shot. Only thing we need to adjust on the field is the hop-up itself due to it being temperature dependent. This is a much more efficient way than just shooting and guessing right before a game starts and is not affected by the wind for example. 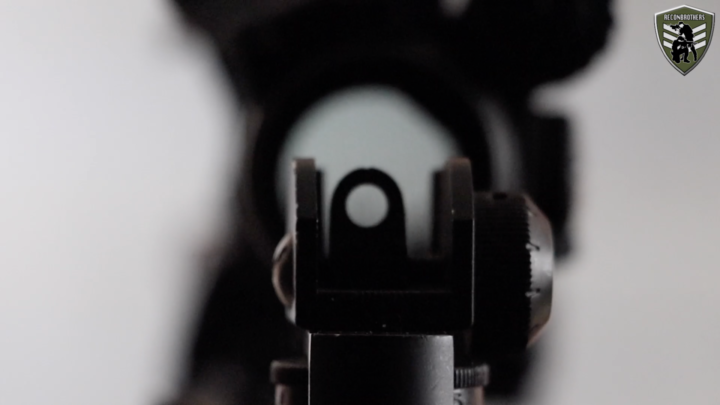 If you guys would like us to teach you this zeroing method in a future video or blog. Please let us know in the comments below. 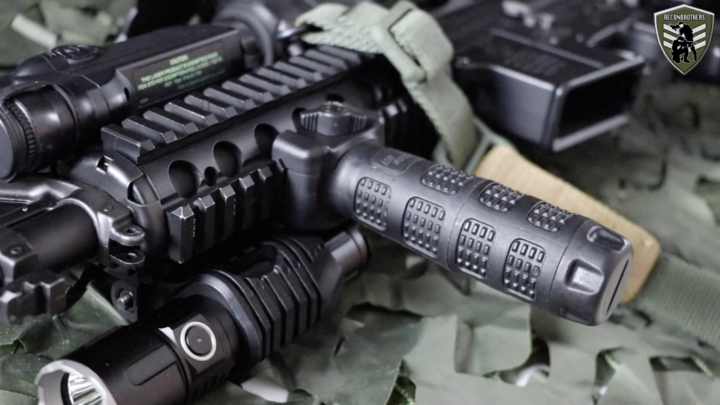 Viper has an IMI Defense interchangeable vertical grip that allows to be both a small and a large grip. The inside is hollow and waterproof and allows him to store a battery inside of it. Instinct used to run with a grip from Tokyo Marui that came with his HK. But, he prefers not to use it anymore nowadays. For clearing those dark areas we both use the Klarus XT11S with a whopping 1100 Lumen and about 27 000 Candela or Cd. This thing has a quick strobe function and a lot of other cool features. It can run for 2 hours on its most powerful mode and runs for 10 days on its lowest energy mode. Also due to it being a professional torch it easily blinds any opponent even if they try to blind us. 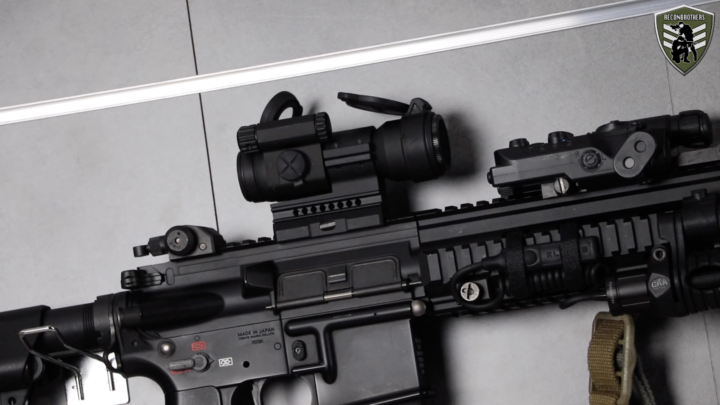 Because this thing goes straight through those Airsoft torches. We’ve mounted these with a CAA Tactical picatinny flashlight adaptor which is a universal mount and enables us to mount it in 5 different positions. As for the positioning and mounting of these things. We both make sure to keep our flashlights away from our body for when we hang them down with our slings. As mentioned before, Instinct doesn’t use a grip anymore. So in order to easily use his torch, he uses a pressure pad mounted on the side of his picatinny rail with Velcro strips about where he puts his fingers. Viper personally doesn’t like the use of a pressure pad on his grip, because he sometimes accidentally turns his flashlight on. 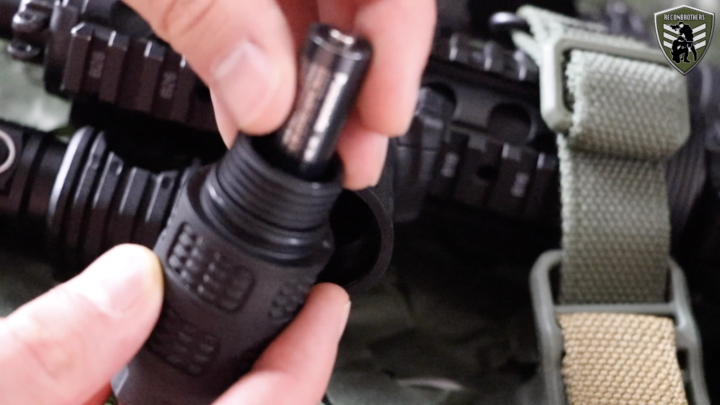 So what he has done is, he placed his grip in a comfortable position for him and has put his flashlight right next to it, so he can easily access it when needed with his thumb. 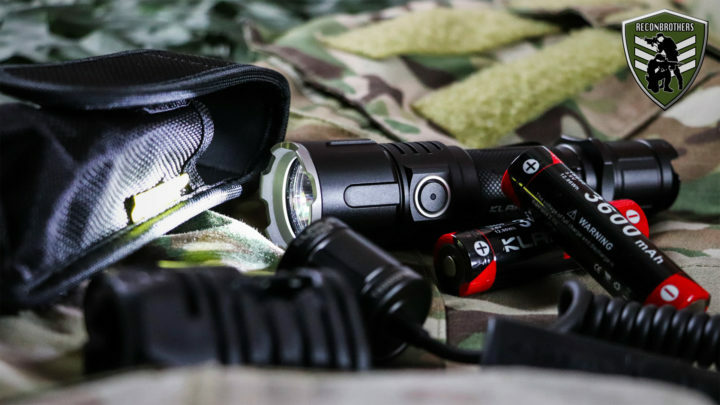 Now, we’ve talked about our optics, grips and flashlight. If you guys want us to go deeper into detail about that kind of stuff in our future videos/blogs. Please let us know in the comments down below. 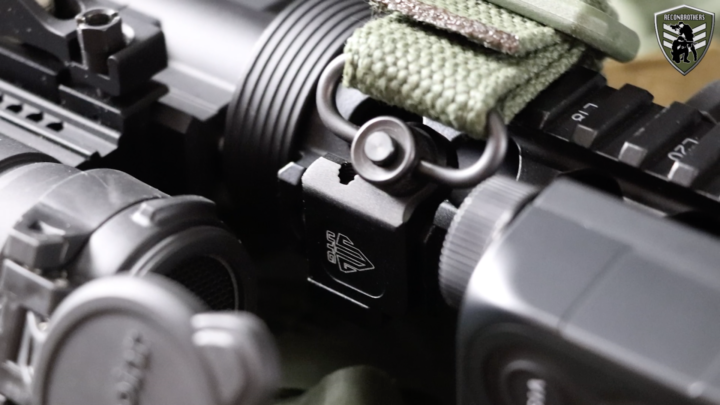 That being said, some of you might have noticed that we also put a Tokyo Marui PEQ box on top of our rail systems. Well, these boxes are not real because it’s even illegal in Belgium to put some sort of laser system on an Airsoft gun. 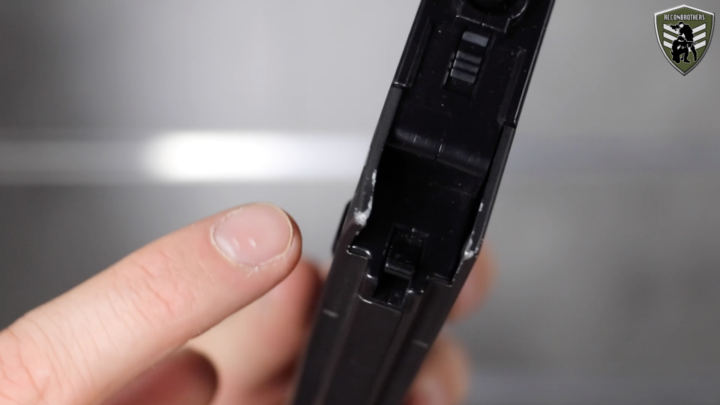 If you ignore this and still do it, your Airsoft gun will be treated as a real gun and that’s not so good. Who comes up with these laws, right? Now that aside, if these aren’t real PEQ boxes what are they then? 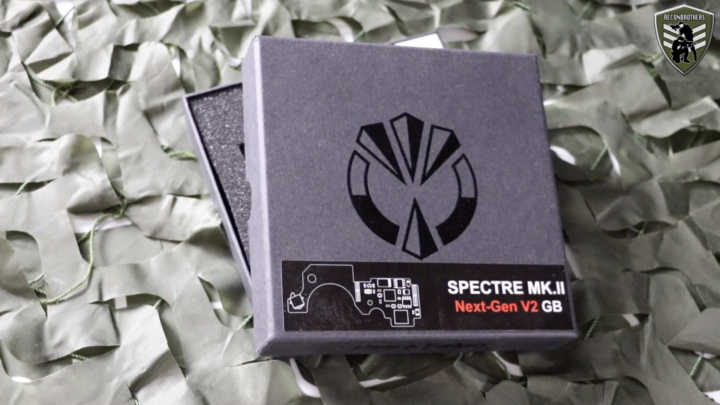 Well, these hollow boxes contain our Mobius cams with zoom lenses to get you guys those “kill cam” shots. We crafted these ourselves which was not the easiest thing to do but they did get some cool footage thus far. Although it would be nice to have something more reliable, because we keep having some issues with them lately. At last we go over a feature that Viper’s personally kind of jealous about, because only Instinct has it and Viper’s a freak when it comes to these things. We’re talking about suppressors of course. So, Instinct his HK came with a dope Tokyo Marui mock suppressor out of the box and Viper wanted one himself, but after some measuring he decided not to get one because it makes his gun way too long and ineffective. 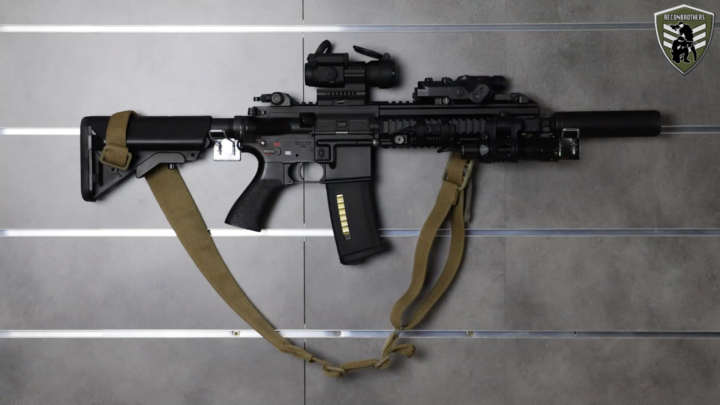 Although that might be something for a future Airsoft gun. 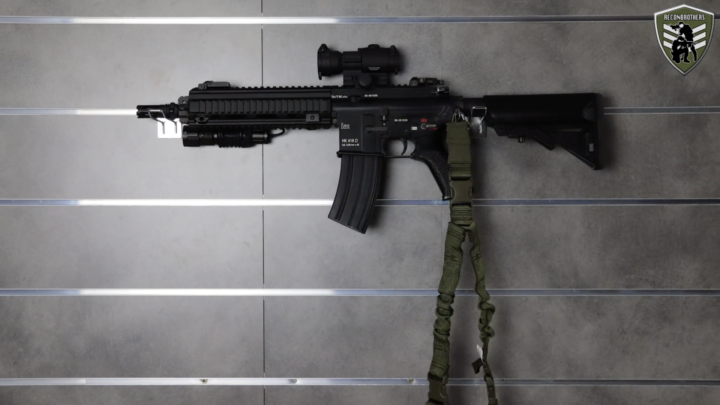 We hope you enjoyed reading about our Tokyo Marui replicas their setup. Let us know what brand of replica you use below.